Throughout most of Wednesday night's ballgame at Raley Field, you were bound to see future San Francisco Giants talent showcasing some of the best they have to offer. Regardless of which half of the inning it was, your odds were good. On the mound for the Triple-A affiliate Sacramento River Cats was consensus No. 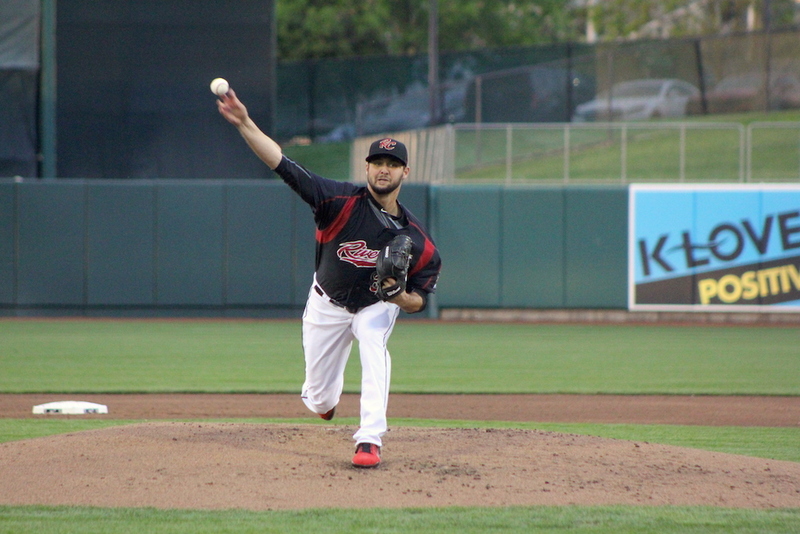 1 prospect Tyler Beede making his third start of the season. Batting second and playing shortstop was No. 2 prospect Christian Arroyo, successfully extending his hitting streak to 12 games. Beede touched 94 with his sinker, and Arroyo touched them all with his second home run in as many games. A few of you have already pointed out that the home run swing (0:14 mark) looks like a pop-up. It was an absolute moonshot that the wind may have aided, but a two-run, first-inning home run nonetheless. He added a double in the 9th inning to raise his isolated slugging percentage (ISO) to .271 through 51 plate appearances. Throw in a couple infield singles and you have the highest qualifying batting average in all of the minor leagues at .479. "Stay hot" is an understatement. On the other side of the diamond, Beede rebounded from a predictably irritating Pacific Coast League start at elevation. He allowed six runs on five hits and four walks last week in Salt Lake City against the Bees. Returning to sea level comfort of the capital city, Beede went 6.2 scoreless with six baserunners (three hits, three walks) to his name. I spoke with the right-hander after the game. As usual, Beede provided detailed insight. He was noticeably fastball-heavy in the first few innings, sitting comfortably with his sinker at 92-93 while reaching 94 about half a dozen times throughout his 93-pitch outing. "That team is so talented in the box and they're on fire," Beede said. "I didn't want to do too much. I wanted to establish my fastball and I just noticed my sinker was sinking especially late in the zone and getting soft contact. I really wanted to stick with that and as soon as I saw them cheating to the fastball I wanted to mix things in — throw some cutters and a decent amount of changeups, nothing that earned their respect, and then the curveball was the pitch that caught them off balance." Two of Beede's four strikeouts were the result of a curveball, in the 82-84 mph range, that he floated in there for opposing hitters to watch for strike three. Beede also revealed a pitch he didn't throw to the Bees lineup last week. "Last game I faced them I didn't throw the cutter at all," Beede said. "It's a pitch that I'm pretty confident in, and I think [Jeff Arnold] is just a little more comfortable with me back there. He's caught me in the past and he was able to call [the cutter] in certain counts. We were on the same page. I really like throwing to [Arnold]. He does an exceptional job of calling a game, and controlling me out there, too." Relying heavily on his sinker, Beede got his first experience pitching at an altitude that has the reputation of destroying a sinkerballer's effectiveness. He brushed off the challenge pitching at 4,226 feet of elevation presented. "It wasn't terrible," Beede admitted. "Until I got to the fourth inning. It was a situation where I was falling behind guys and I didn't throw any different pitch to get my fastball command and my arm slot back into a position where I could command the zone. In terms of my pitches, I felt that my curveball was breaking exceptionally well that game. And my changeup was pretty good, too. So I think just not being too discouraged about that game but at the same time taking it as a positive knowing that there's a lot that I can learn from that outing. It just motivated me to get back to work and know what I needed to do to get better against a good lineup." Any time you can allow zero runs and fewer baserunners than innings pitched, you've succeeded as a starting pitcher. Beede commented on what he could still learn from Wednesday's scoreless start. "I think whenever I get into a 3-2 count, I don't want to give in. Hitting is so hard that I don't want to be out there trying to nibble and make a perfect pitch 3-2. I hate walking guys but it's not the end of the world. I used to dwell on it. But when I get into a deeper count, I just want to make sure I'm throwing quality pitches. Which is the same mindset when I'm 0-0 and ahead in counts. A lot that I can work on. My changeup needs to be more consistent. I can't go one week on, one week off with it. But I was happy with my fastball command. I focused a lot on it in my bullpen this week. Commanding my glove-side fastball, my sinker." Beede will make another home start next Tuesday against Las Vegas before the River Cats go on a nine-game road trip — a rare trip that won't feature elevated cities. They'll play five in Tacoma, Wash. and four in the Giants' old stomping grounds of Chukchansi Park in Fresno. Before I touch on other action in the Giants' farm system, I'll leave you with two final clips from Raley Field Wednesday night. The first is Ryder Jones, who has recorded a hit in each of his first four games since returning from the disabled list. Second is Jae-Gyun Hwang, who smoked two line-drive singles in a 2-for-4 performance. — D.J. Snelten remains one of a few minor league relievers on the farm who have yet to allow a run in 2017. Snelten threw 1.1 innings on Wednesday and struck out two. That makes it 7.1 innings and eight strikeouts in the early going for the tall left-hander. — The San Jose Giants had a relatively uneventful doubleheader at Muni, losing both contests to the Visalia Rawhide while scoring just three runs. Aside from Michael Morse and Mac Williamson making rehab starts in game one, the lone highlight was catcher Aramis Garcia, who went 2-for-3 with a double and a home run. He's rocking a 1.109 OPS and 215 wRC+ through his first 47 plate appearances.